Poison have released a short video featuring footage from their 2017 North American tour with Def Leppard and Tesla. The bands hooked up for a three-month spring run that opened in Manchester, NH on April 8 and wrapped up on June 25 in Indianapolis, IN. 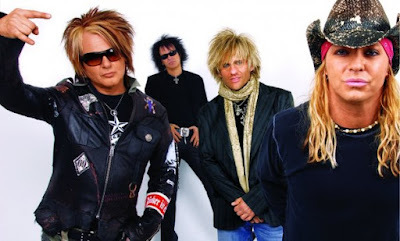 The trek – which also featured a series of 30th anniversary headline dates by the Pennsylvania outfit – marked the first time in over five years Poison toured with its original lineup of vocalist Bret Michaels, guitarist C.C. DeVille, drummer Rikki Rockett and bassist Bobby Dall. Rockett encouraged fans on the tour to help him raise funds to support immunotherapy at Moores Cancer Center at UC San Diego Health after successfully completing a clinical trial that declared him cancer-free last summer. "Without the doctors and staff at Moores Cancer Center, I can honestly say I don't think I'd be here today, to say nothing about playing drums and going on tour again," said Rockett before hitting the road. "I am incredibly grateful that I've got my life back and I'll get to see my two children grow up."